Manohar ShettyManohar Shetty has published five books of poems, including ‘Domestic Creatures’ (Oxford University Press, New Delhi). His poems have been widely published and anthologized. In the UK his poems have appeared in ‘London Magazine’, ‘Poetry Review’, ‘Wasafiri’ and ‘Poetry Wales’. He has edited a special edition on English language poets of India for ‘Poetry Wales’. In the United States his poems have appeared in ‘Chelsea’, ‘Rattapallax’, ‘Fulcrum’, ‘Shenandoah’ and ‘New Letters’, and in ‘Helix’ in Australia. Several anthologies feature his work, notably ‘The Oxford-India Anthology of Twelve Modern Indian Poets’ ( Ed Arvind Krishna Mehrotra, OUP, N Delhi). His poems have been translated into Italian, Finnish, German and Slovenian. He has been a Homi Bhaba Fellow and a Senior Sahitya Akademi Fellow. He edited ‘Goa Today’, a monthly magazine, for eight years and has worked in magazines and newspapers in Bombay, Bangalore and Goa. He is a regular reviewer of books for various Sunday papers and magazines in India. In 2004, he won the top prize in the nation wide ‘Asian Age’ Short Story Competition. 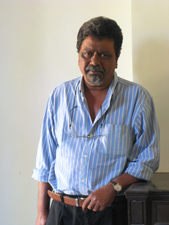 He has edited ‘Ferry Crossing—Short Stories from Goa’ (Penguin India), which has gone into four editions. He has lived in Goa since 1985 from where he runs Ms Editorial Services which edits .and reworks all manuscripts including academic dissertations, novels, short story collections, travelogues and long articles and features. MANOHAR SHETTY has rediscovered Goa in his writing and his poems. One of his love poems, ‘GIFTS’ has appeared in Arvind Krishna Mehrotra’s ‘The Oxford-India Anthology of Twelve Modern Indian Poets’, and from there into an Italian translation for a journal called Clandestino, and then into a wonderful, multilingual anthology of love poetry, Amore in Verse, published in Rome.